During the month of February, Kathleen Bauer, of Good Stuff NW, and Tami Parr, of Pacific Northwest Cheese Project, are sponsoring Blog for Food, a fundraiser for the Oregon Food Bank. Bloggers: To participate, contact Kathleen or Tami, via their blogs. 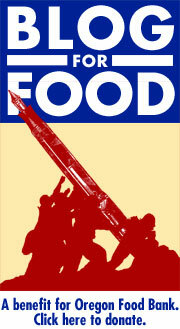 All they ask is that you post once during the month on the effort and place the "Blog for Food" banner on your site, with a link to the donation page at the food bank. They're hoping to raise at least $5,000 during the campaign. One more thing, and this is important: If you donate, enter "Blog for Food" in the "Tribute in honor of" section on the food bank site. That way, the effort will be recognized!